This week two training days were held for North Carolina Law Enforcement personnel. 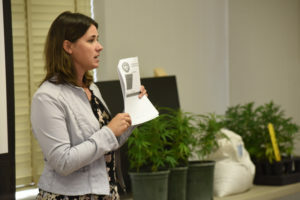 NC State researchers, in conjunction with the Industrial Hemp Commission and the N.C. Department of Agriculture & Consumer Services, hosted training seminars in Salisbury, NC and Waynesville, NC. Dr. Angela Post discusses the Industrial Hemp Pilot Program. Law enforcement personnel from across the state received information and training on such topics as licensing, transportation, and pilot program compliance. 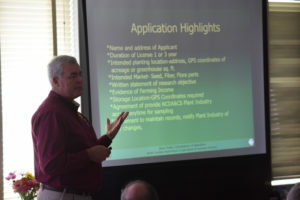 Topic presenters included Industrial Hemp Commissioners, NC State Researchers, and N.C. Department of Agriculture & Consumer Services staff. 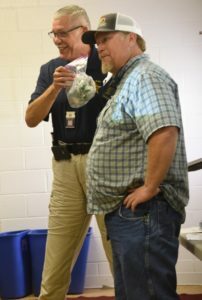 Sheriff Sam Page does a demonstration with a licensed hemp grower. 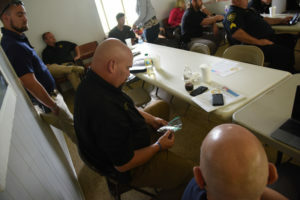 More than 100 law enforcement personnel from agencies such as the Sheriff’s Department, local city law enforcement, and State Bureau of Investigation (SBI) attended the training sessions. In addition to presentations about the NC Industrial Hemp Program, law enforcement personnel participated in an open-discussion panel about challenges facing law enforcement and received a tour of hemp research fields. Law Enforcement inspects training samples of industrial hemp. NCDA&CS Plant Industries Director, Phil Wilson, talks to law enforcement about licensing. The Industrial Hemp Pilot Program in North Carolina began in the Spring of 2017. The Industrial Hemp Commission regulates the program in North Carolina. The 9-member Commission includes two law enforcement officers. Another Law Enforcement Training day will be held in the East part of the state on August 30th in Kinston, NC. For more information, please email the program at IndustrialHemp@NCSU.edu.